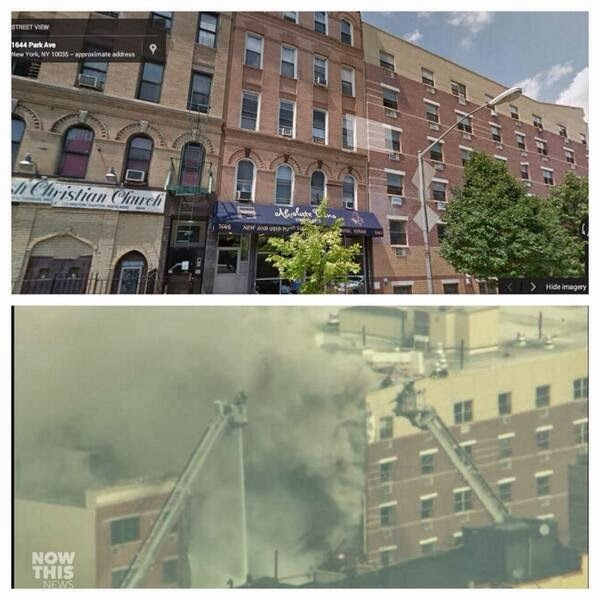 An explosion in Upper Manhattan on Wednesday levelled a five-storey building, sent flames and billowing black smoke above the skyline. 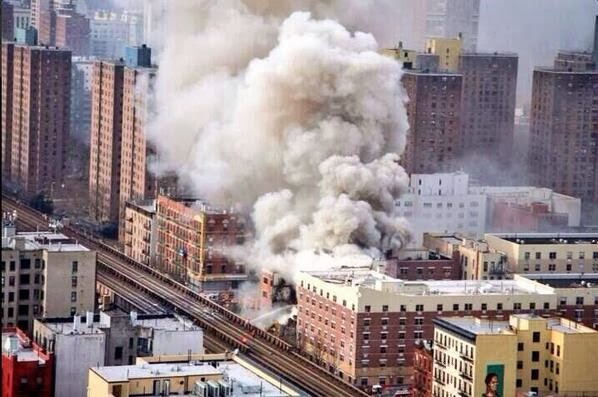 NEW YORK—An explosion has levelled a New York City apartment building, killing one person and injuring 15 others. The New York Police Department says one person died. No other information is available. Residents heard a large explosion near Park Avenue and 116th Street in East Harlem around 9 a.m. Wednesday. One five-storey building was reduced to rubble, and images from the scene showed a second building also was badly damaged. TV news footage shows billowing smoke and firefighters dousing the site from ladder trucks. Bricks also cover parked vehicles. Sidewalks for blocks around are littered with broken glass from shattered storefront and apartment windows. The site is next to Metro-North commuter railroad tracks. Train service is halted to and from Grand Central Terminal. 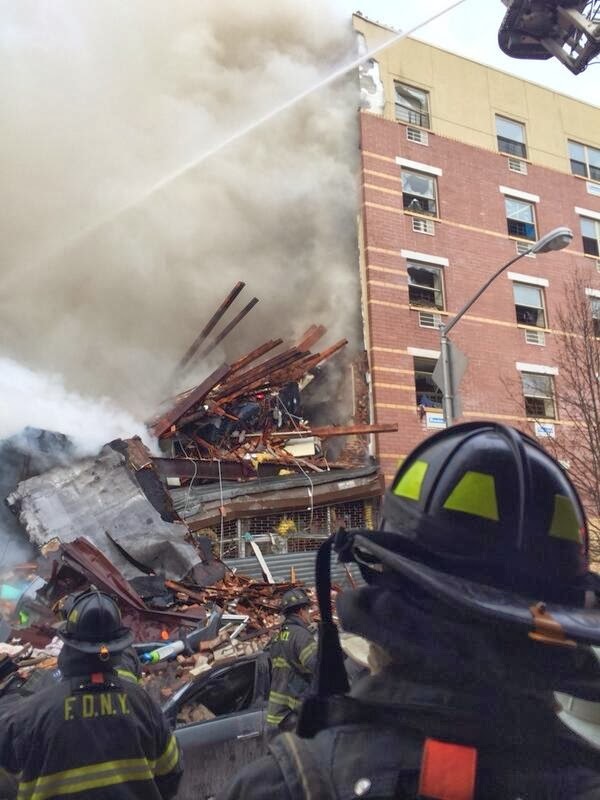 An explosion in Upper Manhattan on Wednesday levelled a five-story building, sent flames and billowing black smoke above the skyline and injured 11 people. One person with “serious trauma” was being treated at Harlem Hospital, and the hospital was expecting more injured people to arrive, said Lamarr Nelson, a hospital spokesman. Sidewalks for blocks around were littered with broken glass from shattered storefront and apartment windows. 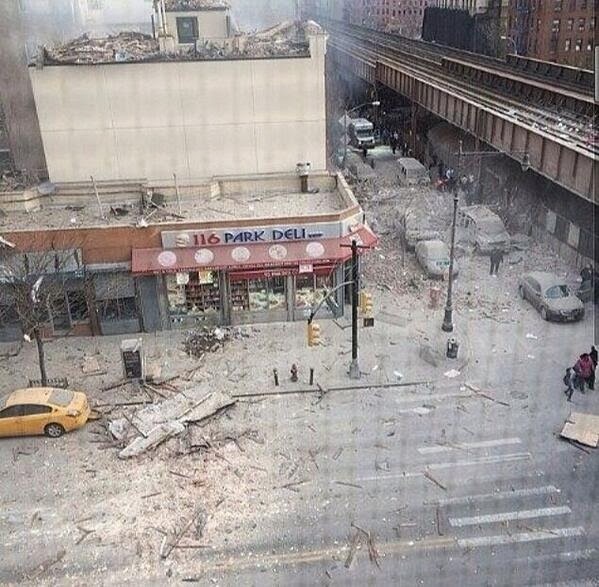 Witnesses say the blast neat Park Avenue and 116th Street was so powerful it knocked groceries off the shelves of nearby stores. A neighbouring building was severely damaged. The cause of the blast was unclear. Police, some wearing gas masks and medical masks, handed out medical masks to residents and onlookers because of the thick white smoke that shrouded the area. The Associated Press reports that at least 16 people were injured in the collapse, one seriously, in the 9 a.m. explosion. One five-storey building collapsed, and a second building was badly damaged. A man named Mitch, who was at work in a nearby barbershop, told MSNBC that he can see the smoke from half a block away. "I heard it, and I felt it," he said of the explosion. "There's broken glass from buildings, from windows ... it was a pretty big explosion." Eoin Hayes, 26, said the explosion shook his entire apartment building in Harlem at about 9:30 a.m. He ran to the window and saw flames consuming one building and smoke rising into the air. Hayes lives less than 10 blocks from where the explosion happened. He said the fire consumed one building and then moved on to another building adjacent to it, though about 40 minutes later the flames had subsided and there was mostly just smoke. Both buildings appeared to be residential. “I ran to the window and saw the fire and the smoke going up and the sirens start,” Hayes said. The explosion occurred very close to elevated Metro-North commuter railroad tracks. Metro-North service was suspended to and from Grand Central on all three train lines while employees remove debris from the tracks. The fire department said it sent nearly 170 members to the scene.